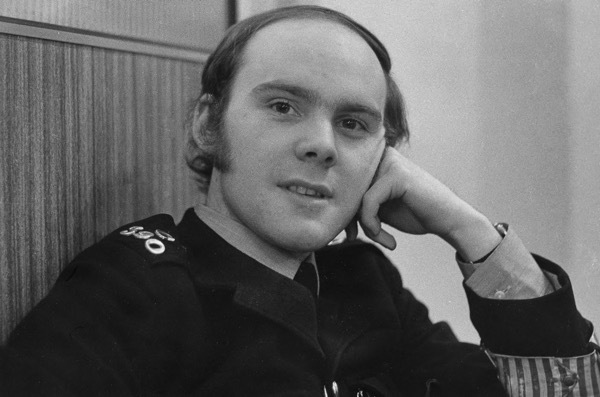 “One week in December 1972, I was on night duty. 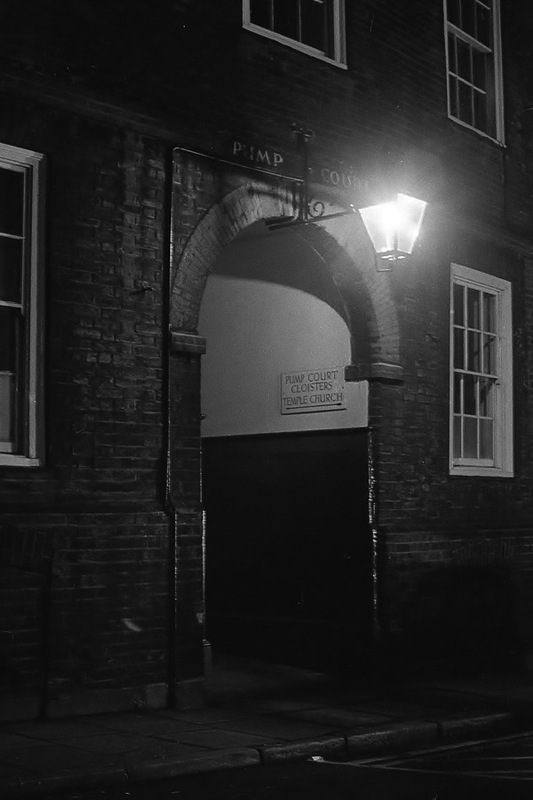 Normally, I would be on beat patrol from Bishopsgate Police Station between 11pm-7am. 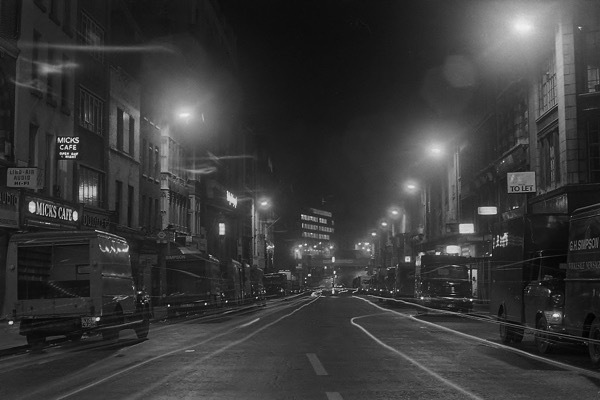 But that week I was on the utility van which operated between 10pm-6am, so there would be cover during the changeover times for the three City of London Police divisions – Bishopsgate, Wood St and Snow Hill. One constable from each division would be on the van with a sergeant and a driver from the garage. 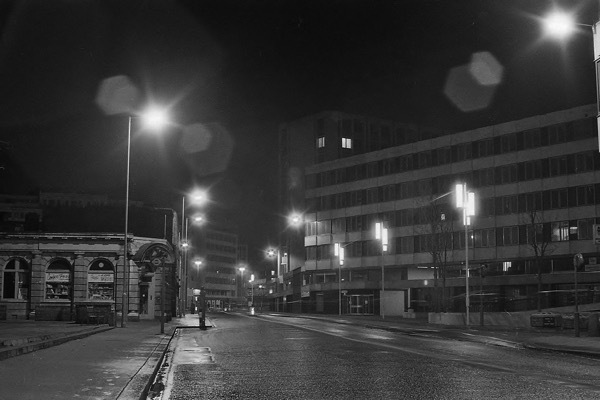 That night, I was dropped off on the Embankment during a break to allow me to take some photographs and I walked back to Wood St Police Station to rejoin the van crew. You can follow the route in my photographs. 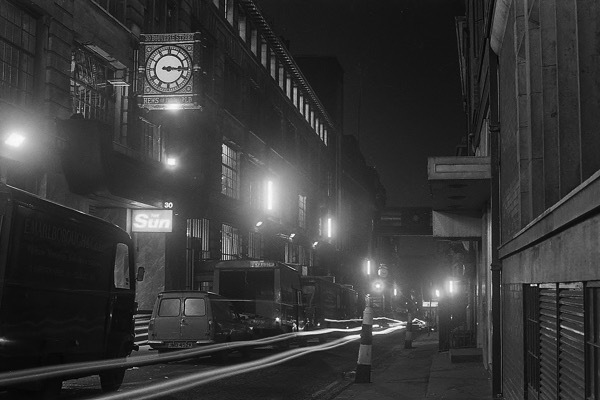 The City of London at night was a peaceful place to walk, apart from the parts that operated twenty-four hours a day – the newspaper printshops in Fleet Street, Smithfield Meat Market, Billingsgate Fish Market and Spitalfields Fruit & Vegetable Market. Micks Cafe in Fleet St never had an apostrophe on the sign or acute accent on the ‘e.’ It was a cramped greasy spoon that opened twenty-four hours a day, seven days a week. 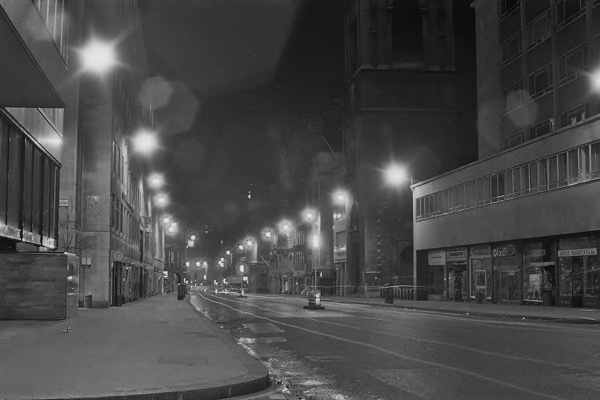 During the night and early morning it served print-workers, drunks returning from the West End and the occasional vagrant. 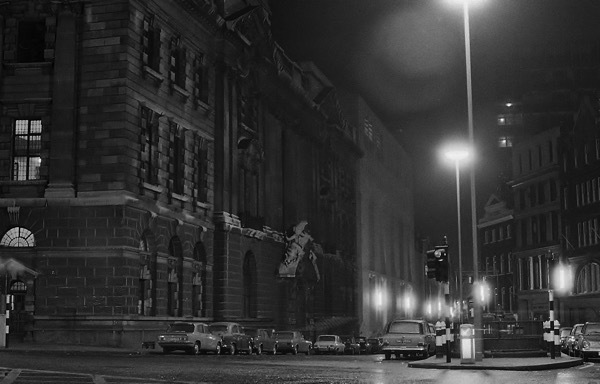 Great photos – very atmospheric! 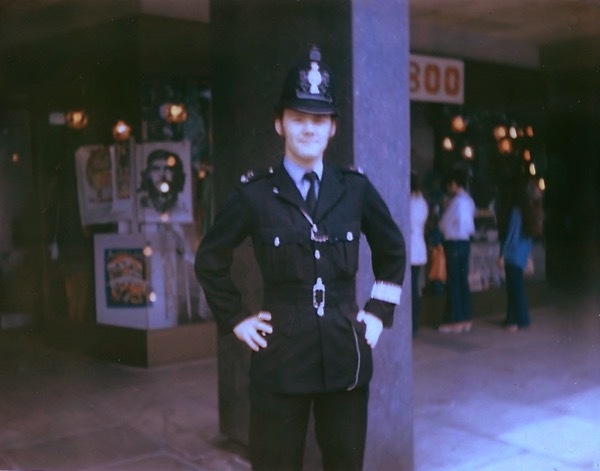 Keep them coming Lew there fantastic pictures and great memories of walks around London with my Father around that time it was so atmospheric. I love these pictures. I hope there will be more from Lew Tassell. brilliant photos – London how I first knew it! Great photos of a London so full of character, l enjoyed reading about it too. Sadly the area has changed and keeps on changing but it doesn’t take the memories away! I thought I remembered walking under the bridge at Ludgate Circus! Turns out I was right. I used to live in the City in the late 70s and this is exactly how I recall it. Weird to see ordinary cars just parked at the side of the road. Micks Cafe ! Well I knew it . 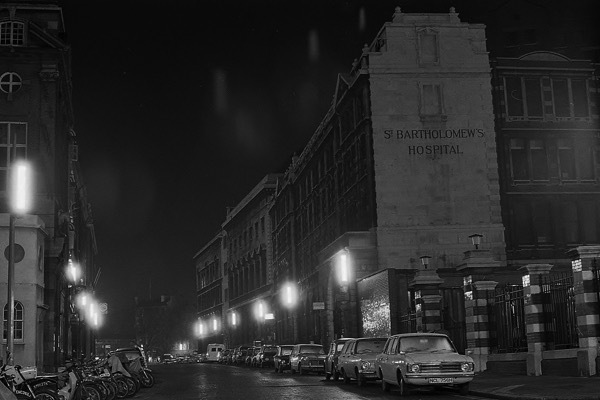 As a 16 yo Young Socialist we would go to visit the printers union reps in Fleet street on the late shift to try and canvass support for the anti Veitnam war marches and stop off there afterwards for a late night tea before heading home. Micks cafe . What a memory ! 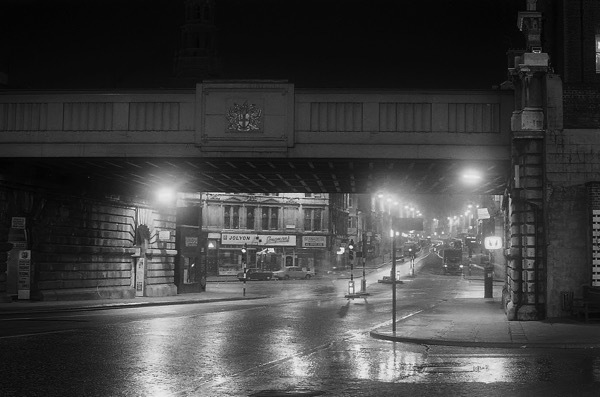 It attracted the London working night shift , the late night reveller, and the homeless. There was nowhere else open. Thank you! 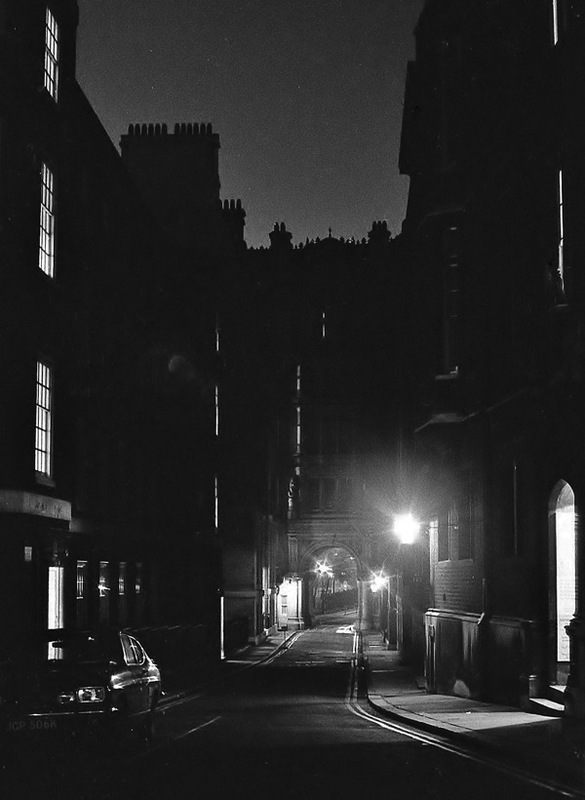 Lew’s photograph of Middle Temple Lane is worthy of a gallery. His black and white print incorporates the spirit as opposed to the mundane. What camera where you using Lew, and what speed film. I second Roger’s comment and would like to know camera type and film speed. The photos are stunning and as Sonia remarks, are “worthy of a gallery”. Thank you for this Spitalfields Life entry. 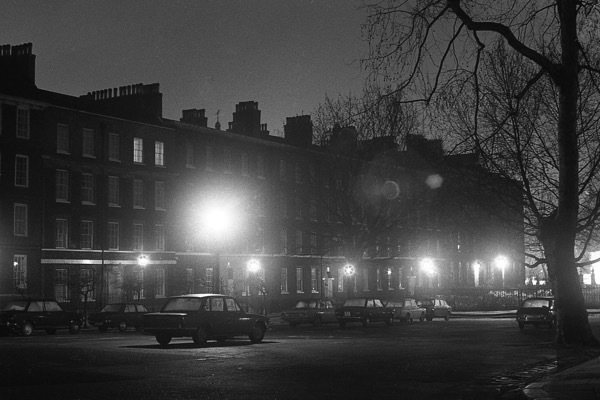 Some stunning pictures there, especially the one of Middle Temple Lane. But all of them very evocative of how things used to be. “Ludgate Hill – A block in the Street” — from London, A Pilgrimage, 1872. In reply to Roger Tiller and Andy Nemeth and their request for the technical details. The camera I was using was a Yashica TL Electro X. 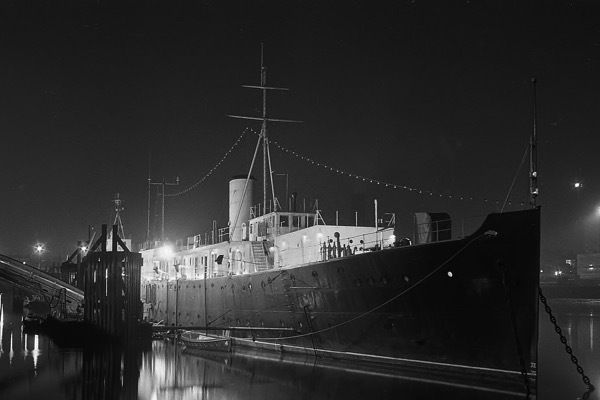 The film was Kodak Tri X and exposures were between 15 and 35 seconds at F8 or F11. Lew, what a great article and photos. Amazing to see the City with no one around, slightly different now with the 24 hour culture. My wife and I are serving officers in the City. I believe she has inherited your old collar number, although it’s now 390cp, we dropped the A, B, C etc a few years ago. Thanks for that comment Craig, I always look out for “390″ when I’m in the City but have yet to see it since I retired. These are excellent photos, and indeed, depict a very different time – Police in those days were helpful figures on the streets, and were mostly well liked. Can’t say the same today — nowadays, they look threatening , arrogant and distinctly unhelpful, and are mostly absent on the streets anyway, just as we really need them.